Schysn Kasaka Apassna (Cossacks Must Ride) [Russian] [3:19] Available on the Stenka Rasin CD. Available with an English lead vocal on the The Very Best of Ivan Rebroff Volume II CD and the Somewhere My Love LP. Krassawitza Rassija (My Russia, You are Beautiful) [Russian] [3:31] Available on the Stenka Rasin CD. Also available with English lead vocal as Russia is my Homeland on the Somewhere My Love LP. Available with German lead vocal as Mein Russland, du bist schön on the Simply The Best CD and the Mein Russland, du bist schön LP. Hej Andrjuschka (Hey, Andrushka) [Russian] [2:25] Available on the Kalinka & Simply The Best CDs. Available with English lead vocal on the The Very Best of Ivan Rebroff Volume II CD and the Somewhere My Love LP. Available with German lead vocal on the Meine russischen Traume CD and Mein Russland, du bist schön LP. Saitschem Ziwodna Strezil Wnow Tebja (Troika Along the Volga) [Russian] [3:09] Available on the Kalinka & The Very Best of Ivan Rebroff CDs. Version with German lead vocal is available on the Glasnost Perestroika CD and Mein Russland, du bist schön LP. Mtschiza Trojka (Gypsy Drinking Song) [Russian] [2:47] Available on the Kalinka CD. Poj Zynganka (Play, Gypsy) [Russian] [3:45] Available on the Kalinka & The Very Best of Ivan Rebroff CDs. Satschem Nje Tebja Polubil (The Reins Tightly in Hand) [Russian] [3:28] Available on the Kalinka CD. Matuschka (Matushka) [Russian] [3:01] Available on the Stenka Rasin CD. Ach Natascha (Oh, Natasha) [Russian] [2:20] Available on the Kalinka CD. Available with German lead vocal on the Glasnost Perestroika & The Very Best of Ivan Rebroff CDs and Mein Russland, du bist schön LP. Ech Odessa (Hey, Odessa) [Russian] [2:10] Available on the Kalinka CD. Available with a German lead vocal as In Odessa on the Simply The Best CD and Mein Russland, du bist schön LP. Pojedu, Wjedu Ja Wo Ljosotschek (Girls in the Field) [Russian] [3:02] Available on the Kalinka CD. Spischi Lasachatka (Hurry, Hurry, Little Horse) [Russian] [3:51] Available on the Kalinka CD. 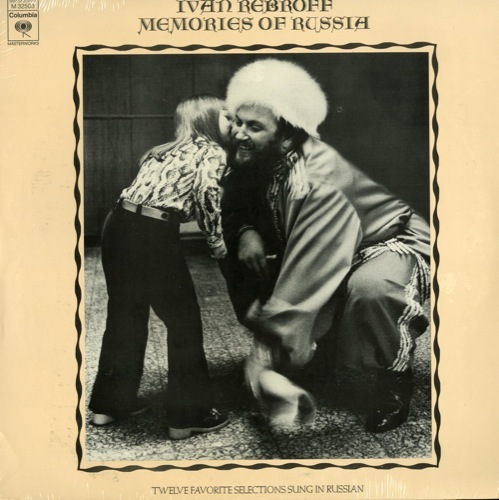 This is the same track listing as the Erinnerungen an Russland & The Best of Ivan Rebroff Volume II albums, though here the track names are given in Russian and English.